In 1999 Dr Rundeep Gadh received his Bachelor of Science Degree in Biology from Nova Southeastern University and went on to obtain a Medical degree (D.O.) at Nova Southeastern University College of Osteopathic Medicine. In 2007 he completed his Family Medicine Residency at Palmetto General Hospital and became Board Certified in Family Medicine. Dr Gadh is an active Member of the American Osteopathic Association and the American College of Osteopathic Family Physicians. 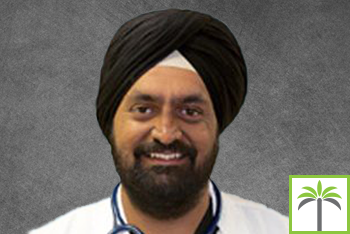 Dr. Rundeep Gadh, born and raised in South Florida, is a huge fan of the Miami Dolphins and the Miami Heat. He is married to Dr. Ruchika Gadh and has three beautiful daughters. In addition to being a sports fan, he enjoys traveling, swimming, skiing and spending valuable time with his family and friends.